A vicious and armed attack on two of my ancestors in 1879. The Grapes Inn, Attleborough, Norfolk. I wonder if that is my great great grandmother Ann Smith (nee Peach), standing in front of the beerhouse in this old photograph? I first heard of The Grapes from my late grandmother Doris Brooker. She recalled in her childhood, her father, Frederick Smith, once taking her by horse and cart to a pub in Attleborough, that had a grapevine growing in the doorway. If you look at the above photograph, I think you can see growth on the front of the building. Was that the same vine? 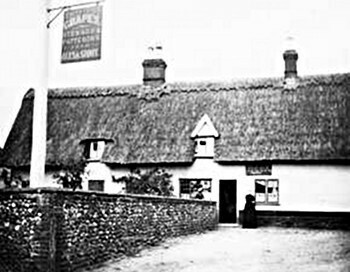 I had just seen a census that recorded her grandfather, as the victualler of the Grapes Beerhouse in Attleborough. It connected. She didn't know, but that beerhouse was where his parents had lived. My 2nd great grandfather Robert Smith, had been born in Attleborough in 1833, to a local family. His father, Robert the senior, at one point, lead a local riot against the background of the Swing Riots. After a sentence imprisoned in Norwich Castle Gaol, Robert the senior made a living as a hawker, umbrella maker, and as a labourer. In his fifties, he finally escaped the Agricultural Depression by taking a second wife, on the new railways to Sculcoates, a cotton spinning town in Yorkshire. Robert the junior and other siblings though, remained in Attleborough. Robert the junior's wife, my 2nd great grandmother, Ann (nee Peach), had been born at Etton, Northants, in 1835, although her mother, Sarah Peach (nee Riches) was from a local Norfolk family. When Ann was an infant, her father David Peach was convicted of stealing two steers, and transported to Tasmania. Sarah and Ann returned to Norfolk. Ann subsequently must have grown up in a very poor single parent family in the town. Her mother Sarah, unable to remarry, made a living as a charwoman. So both Robert and Ann were born into more poverty rather than riches. They married at Attleborough in 1857. Robert had become a bricklayer. That's the background. That 1881 Census shows the family two years after the event that I am now going to retell. It was about one o'clock in the morning on the first of March, 1879. The beerhouse was closed. My great great grandmother Ann Smith, was suddenly awakened by a noise and a light on the landing. As she reached out to the bedroom door in order to investigate, a masked man carrying a revolver pushed into the bedroom, exclaiming "hoi-a-hoi!". Her husband Robert now awake, the intruder pointed the pistol at his face. The threat made, the burglar backed out to the landing. Just then, their eldest son Harry, awoke by the commotion opened the door of another bedroom. The intruder turned his revolver onto Harry, pointing it at a distance of six inches into his face. Harry slammed the bedroom door shut, and the gun was fired into it, splintering the door. The burglar then bolted from the Grapes, running out of the front door. Robert, Ann, and Harry surveyed the house. The intruder had kicked over a lamp, which needed to be extinguished. The house had been ransacked. Robert's silver pocket watch and chain had been stolen, some money, a carving knife, and some silver from a dresser. The thief was a 20 year old John Clarke, originally from Shields in the North of England, but who had spent some time himself as a bricklayer, on the West India Docks in London. He was on a rampage in Norfolk. Armed, he committed a spate of burgalries at Attleborough, Spooner Row, Shipdham, and Foulsham. The following Tuesday, he was at Little Walsingham. It was becoming to risky for him to continue his crime spate in Norfolk, and he was heading for the railway station, to escape back to London. He was tracked by the Police to a Little Walsingham pub, where they preceded to question him. He made a dash for it. As the police officers pursued him through the village, three times he raised his revolver and fired the gun at them - missing every time. He reached the village of Great Walsingham. The Police officers had by now commodeared a horse and cart to pursue him. Locals joined in, including a game keeper's son called Codman. More shots were fired - one through Codman's apron! They chased him across the fields. Another bullet struck a horse in the neck. The rider of that horse, PC Goll, diismounted and forced Clarke to the ground - the gun fired again during the struggle. Goll managed to part him from the revolver, and to handcuff him. Clarke was found with a number of stolen items including my great great grandfather's watch. He also had a piece of glass, painted with a death skull, that he would use with a lamp to frighten his victims. The next morning, he gave a full confession. He was taken later that day to Norwich Shirehall. Angry crowds beseiged the building and a force of police had to keep order. There he was charged, and Robert, Ann, and Harry gave their accounts, and identified their stolen properties. At the May Assizes, John Clarke was sentenced to twenty years penal servitude. 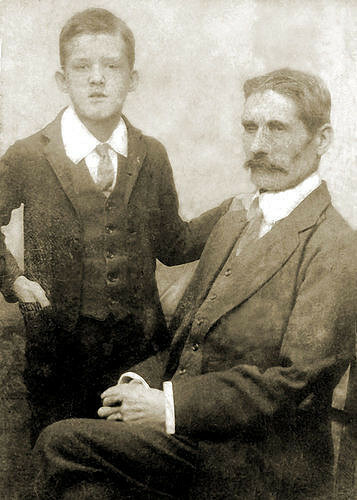 My great grandfather Frederick Smith with his son Lenny.